You are headed to an important business meeting or to meet your girlfriend's parents for the first time and you print out directions using Google Maps. 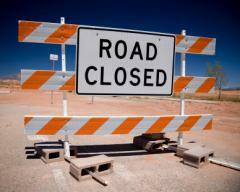 As you are driving along the road, you hit a road closed sign - what do you do now? Road closures are a common thing and Google is not always aware of all the road closures in every area. But did you know that you can report road closures to Google? Dave, a Google Product Manager from Seattle, said you can use the "report a problem" link on the Google Maps page to notify Google of road closures. They ask you to also provide a link to a source as evidence of the road closure. If there's going to be a long road closure in your area, you can report it to us through the "Report a Problem" link in the lower-right corner of the map. If you know the dates of closure, then it's fine (in fact, preferred, since we'd need some time to update our systems) to let us know ahead of time. Make sure you include a pointer to a webpage that confirms the dates of the closure, which our operators can use for verification. So next time you see a road closure that you didn't see reported on Google Maps - do something about it by reporting it to Google.